Blog from Franz Josef, New Zealand | Hello World! Today has been an incredible adventure. We're staying in Franz Josef which is surrounded by temperate rainforest with a massive glacier up in the mountains. This morning we took a 5 minute helicopter ride up to the top of the glacier, and our guide took us on a 3 hour hike around the ice. I put crampons on for the first time and the views were stunning. We also discovered that our guide was from Exeter and the same age as us! He'd moved to New Zealand 2 years ago to become a glacier guide. Small world. He took is through ice caves and very narrow paths between huge blocks of ice. This afternoon was even crazier. I never thought that I'd ever say the next few words, but I just jumped out of a plane from 16000 feet over Fox glacier. We weren't sure if it was going to go ahead as the weather was a bit dodgy and we were supposed to be doing it yesterday but it got cancelled. So we went straight from the glacier to the skydive place, got all the gear on and met the person we were going down with. Three of us went first. The plane was so tiny but the views from the air was amazing! When we went above the cloud line we could see all the mountains, including Mount Cook. I wasn't nervous at all before the jump, but as we put our oxygen masks on as we got higher the reality began to hit that the only way to get down was jumping. Candice went first and it was amazing to see her drop out of the plane. Then it was my turn. The guide shuffles you to the door and you have to dangle your legs out. And then you're gone. A few seconds above the clouds and then you're through them, freefalling for roughly 65 seconds which was incredible. I think I was screaming the whole time. When the parachute is released they give you some control of the directions. The views were stunning; mountains and glaciers on one side and the Tasman sea on the other. According to Lonely Planet it's the 2nd most scenic skydive in the world, with the first being in the Himalayas. It was amazing but for the first 10 mins afterwards I felt very light headed! 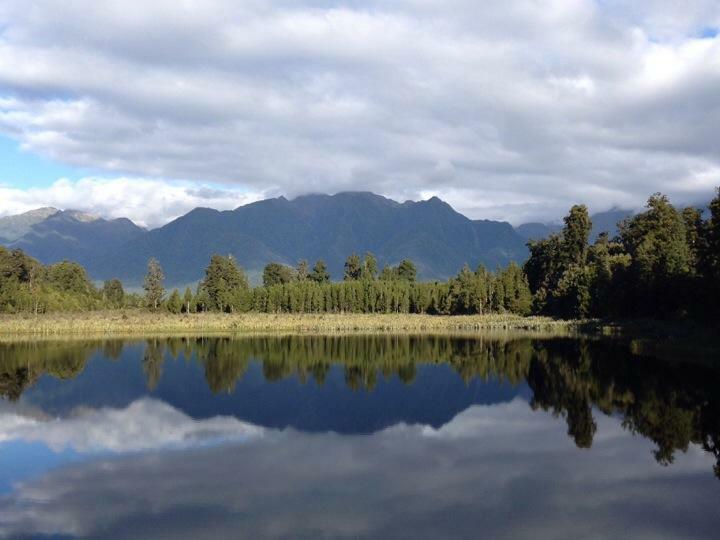 Currently relaxing at Lake Matheson before our lift back to our hostel in Franz Josef.